At Halesowen & District Funeral Directors, we pride ourselves for providing utmost care and compassion to the local families of Halesowen, Lapal, Belle Vale, Hayley Green and Hunnington. At our funeral home we have a warm and welcoming reception area, a private arrangement room and a chapel of rest for you to spend time with your loved one. Whether you prefer a cremation, a traditional or religious funeral or a contemporary service such as a woodland burial, we can arrange it. We will cater to your every wish and need, and try to make this difficult time a little easier for you and your family. No family or person should have to go through bereavement on their own. Should you need us, we are available to call 24 hours a day. Whether it is for help, support or advice, we are here for you. Call us today on 0121 647 3889 to talk through your personal requirements. At Halesowen & District Funeral Directors, we understand how special life is with those that you love. For us, every funeral is unique and personal. We have a service to fulfil every wish, with every detail carried out with the same uncompromising quality of care. From a traditional service, to a colourful woodland burial, your options are limitless with our Full Service Funeral. If you have a little more flexibility when it comes to arrangements, then we can provide a Simple Funeral for a lower cost. There is car parking available at Asda or on Andrew Road. The front of our funeral home is in a cul-de-sac. Take the roundabout exit after Asda. Our staff are available 24 hours a day on 0121 647 3889 if you require our services outside of these hours. 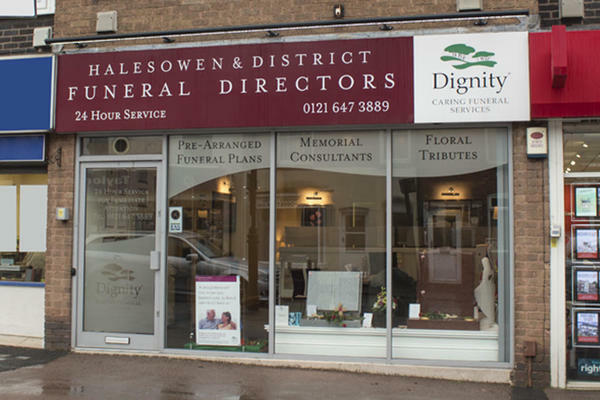 I cannot fault anyone or anything at halesowen funeral directors and dignity funerals. My mom had the perfect send off...I don't know what to say apart from i would recommend you to people every single time. Everyone was lovely and professional.it was just really perfect...as a funeral can be. Thankyou so much everyone. Thank you for the kind comments posted on your online review. I am pleased that the arrangements for your Mother were carried out to your satisfaction and you were so well looked after by our team. Had a pre- paid plan for both parents via Age UK so not sure what to expect and what would be in lauded when it happened. Cannot thank Dignity and Halesowen and district funeral care enough, everything was just as we discussed and requested in the package. The support and advice from the office was brilliant, and the respect and care from the car drivers, vicar and everyone was perfect. Thanks again. Thank you for the kind comments posted on your online review. I am glad that we were able to provide you with the care and support needed at this time and that all of your wishes were carried out by the team as you had requested. Thank you for posting your online review. I am pleased that we provided the highest level of care and guidance to you at such a difficult time.